They actually said that they ramped the Lexlip, Ireland plant earlier than originally planned last quarter. The fact that they brought on additional capacity slightly earlier than expected and they're still facing 14nm product "shortages" is a pretty bad sign. Thanks for sharing. Though I do wonder about what the definition for 'ramped' would be exactly. 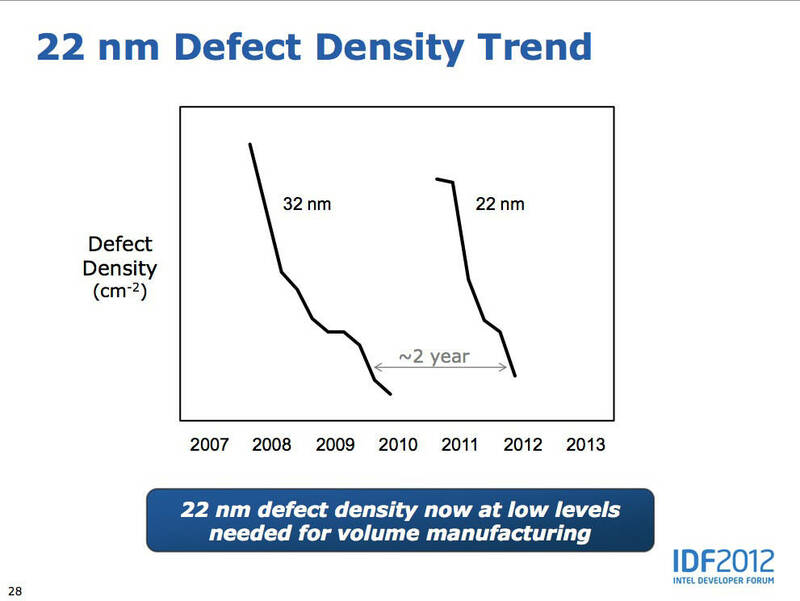 If they'd just started 14nm wafers in Lexlip in late Q3 then it wouldn't necessarily make an impact until end of year, no? A bad sign of what? That they will only match yields in H2'16? Sure, Stacy Smith gave us some graphs, nothing new. That producing 8B x'tor Xeon Phis isn't easy with subpar cost structure? Yeah, RIP gross margins. Those 90mm² 2+2 dies aren't the problem, I'd guess: they sell for enough even factoring in the defect density. 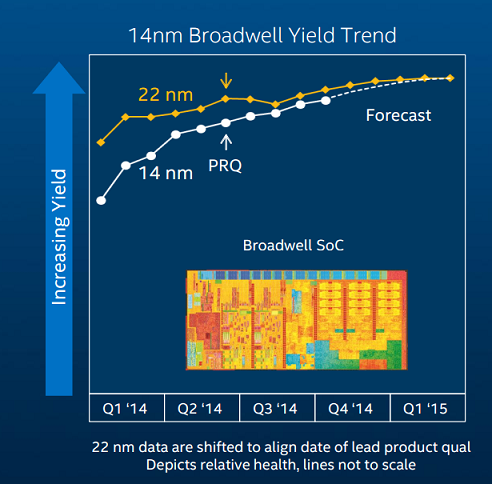 According to Intel even those 2+2 dies are experiencing worse costs on 14nm than correspondent 2+2 22nm dies. BTW, the orange line on the first image goes to Feb 2014: http://intelstudios.edgesuite.net/im/2014/pdf/2014_Intel_IM_Holt.pdf. You can really see that the last data point on Mark Bohr's yield curve was basically the last time they saw improvement at that decent pace which would put them on par in Q2 or even in Q1'15, but in Q4 it flattened and it didn't ever become better. So that's why, although they had already started the front-end of the 10nm start-up for early '16 production in Q4'14, they decided in Q1 to abort the start-up, so really at the last minute. 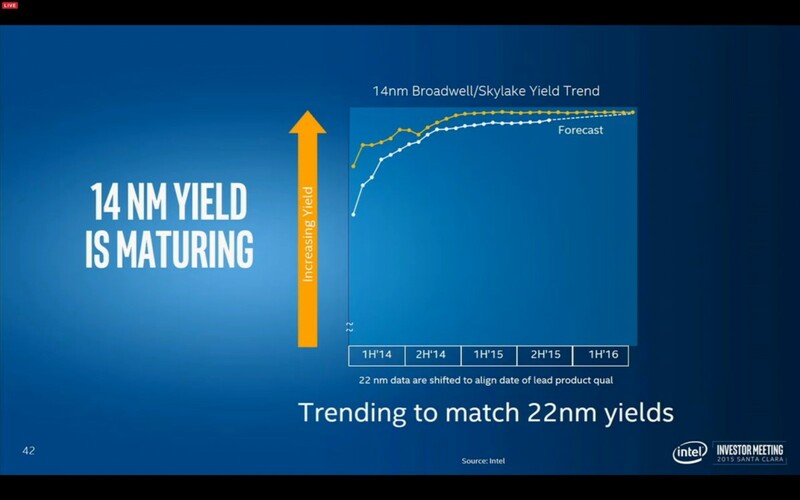 If the 14nm curve would have continued at Bohr's projected pace (which seemed like a reasonable estimate at the time), 10nm, Gen10 and Cannonlake would have been here with us up to a year earlier. Really mind blowing if you think about how close the delay was to manufacturing, just like with 14nm in fact. 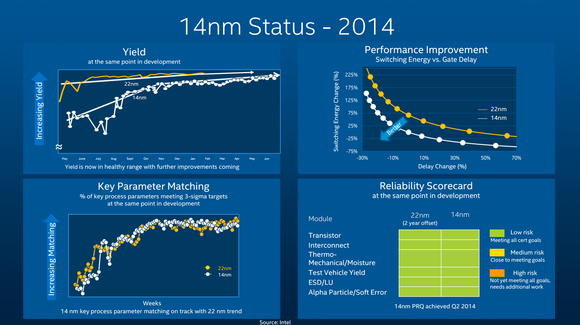 Gotta love how close they were to matching 22nm in Q3'14. Anyway, or will they ramp their yields much later and much quicker like 22nm?